I am concerned at the harsh “Yoke” of control that Christian church leaders exercise upon the Lord’s people. One arena is the call to fast type of control. This is manifested is in the ” calls to fasting” that are made in the churches. Often one solitary Guru type leader or so called Senior pastor tells God’s flock that they are called to fast. Is this degree of control biblically based? Titus 1: 4 to 7 – To Titus, my true child in our common faith: Grace and peace from God the Father and Christ Jesus our Saviour. The reason I left you in Crete was that you would set in order what was unfinished and appoint elders in every town, as I directed you. An elder must be …. ( 2) In general, it is God’s leaders, ( five fold ministry) that are expected to take the lead, shoulder the burden and responsibility in spiritual warfare, fasting etc. In Acts chapter 13 we see such a group consisting of teachers and prophets who together are ministering to the Lord with fasting. the account does NOT say that the whole church was involved in this spiritual discipline; this time of special ministry and fasting was borne by prophets and teachers ( Presumably also, The Holy Spirit spoke collectively to these brothers calling them into this time of fasting). Acts 13: 1 to 4 – Now in the church at Antioch there were prophets and teachers: Barnabas, Simeon called Niger, Lucius of Cyrene, Manaen (who had been brought up with Herod the tetrarch) and Saul. 2While they were worshipping the Lord and fasting, the Holy Spirit said, “Set apart for me Barnabas and Saul for the work to which I have called them.” So after they had fasted and prayed, they placed their hands on them and sent them off. (3) – There are a minimal of ” Necessary things” to be observed by the gentiles who have turned to God from idols. Acts chapter 15 is pivotal. God has included this chapter – almost in the centre of the book of Acts. It is very important! According to Acts 15:10, to impose anything MORE than these things listed in this chapter is in effect to ” tempting God”. 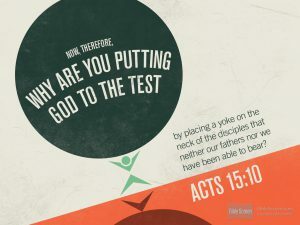 Acts 15:10 – Now therefore why do you put God to the test by placing upon the neck of the disciples a yoke which neither our fathers nor we have been able to bear? The Law of Moses imposed many burdens upon God’s children under the Old Covenant, There where commands, festivals to be compulsorily kept and observances that were described in Acts 15: 10 as things ” hard to put up with”. Dare we, as called ministers of God impose upon Gods ” lambs” another set of special fast days and religious things to replace these many Jewish laws, ordinances, restrictions and disciplines. Christ came to set us free from all such observances under the New Covenant”? Indeed, we as leaders can invite the ” lambs ” to join us in any of these times we feel God has called us to. But, there ought not to be any sense of compulsion or expectation that they join us. They should feel totally free. Any special times of fasting, need for teaching sessions, church disciplines etc., should normally be revealed to the whole group of elders that care for the church. The leaders and ministry gifted members should bear the responsibility. Others in the church may ( and perhaps ought to be invited to join in) – but it needs to be made absolutely clear that there is no sense of compulsion on the flock of God. To do so is to “ tempt God“. 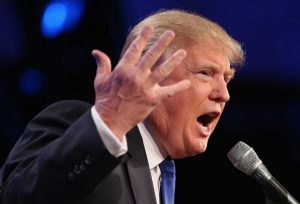 Thank God that many prayers have been answered and Donald Trump has wont the presidential election. But for God’s grace it could have been a very different outcome. Even millions of Born-Again Christians Will have Vote for Hillary Clinton, The reasons they voted for her Will Shock You! The second in the series on the subject, ‘What is heaven like?”. In the first section we have been looking together at the reality of the The New Jerusalem. It is our eternal home. Our home, the New Jerusalem, will be the place where we God’s redeemed children will live forever and shine as the stars for evermore. We will be thrilled as we are looking together at the last two chapters of God’s word, – Revelation chapters 21 and 22. Verse one tells us that there is no more sea. 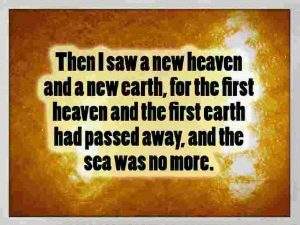 Rev 21:1 – And I saw a new heaven and a new earth: for the first heaven and the first earth were passed away; and there was no more sea. This has disappointed some. But there is no need to worry and be disappointed. There is surely water in this new earth (Rev 22:1 ). There may well be beautiful lakes and parks within the New Jerusalem or on the new earth, which as we shall see later must be greatly enlarged. The New earth will be far bigger than this present old earth; we just are not told everything. 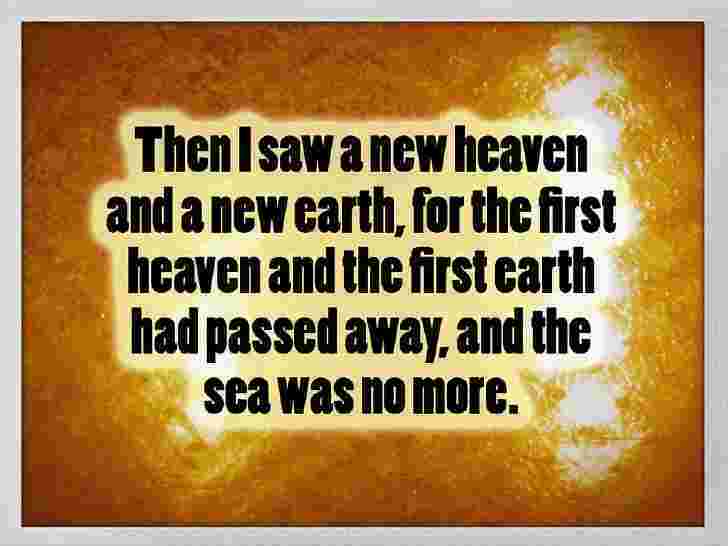 But why is the “sea” no longer present in the New heaven and New earth? Let’s look together as we seek revelation from the Lord as to what is meant by this statement. Firstly as we look into this we will see that scripture often uses the “sea ” as a metaphor of God’s judgement, and also the distress and turmoil among the nations. The sea may also be used to represent that which divides and separates that which should be complete and united. Let’s look at “ the sea” speaking of judgement. We know that God sent a very great sea, a very large deluge of flood in the days of Noah that covered all the earth. God sent a flood and brought judgement on an ungodly generation who had become so corrupt that EVERY imagination of their hearts was only evil continually, (Gen 6:5). Only Noah, his wife and his three sons, together with his sons wives entered the ark that Noah had built and where saved. So here we see that the waters in the day of Noah speak of judgement. Satan and his evil followers have all now been judged and been dealt with and will not be found in the new heaven and new earth. (jER 5:22). The sea is also a holding place for evil spirits that have been judged and are waiting for final judgement in the Lake of fire . Revelation chapter 9 tells us that at this moment in time God has bound up four angels in the great river Euphrates. The sea will also give up its dead for the final judgement day. Rev 9:13, 14 – And the sixth angel sounded, and I heard a voice from the four horns of the golden altar which is before God, Saying to the sixth angel which had the trumpet, Loose the four angels which are bound in the great river Euphrates. Rev 20: 13 – And the sea gave up the dead which were in it; and death and hell delivered up the dead which were in them: and they were judged every man according to their works. Many believe that the reference to the “face of the deep” in the second verse of the book of Genesis speaks of judgement. 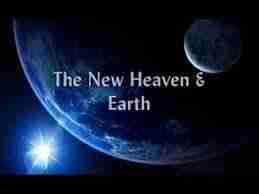 Gen 1:1 and 2 – In the beginning God created the heaven and the earth. 2 And the earth was ( alt., became) without form, and void; and darkness was upon the face of the deep. And the Spirit of God moved upon the face of the waters. Many good bible teachers believe that the “ face of the deep” speak of waters that God used to judge a previous world that had existed before the time of Adam and Eve. It is possible that there is a vast gap, involving a time of God’s judgement between the first and second verses of Genesis. If we look at the Hebrew word for “was” in Genesis 1:2, we see that it can equally be translated, “became”. Thus, the first two verses of Genesis will read, “In the beginning God created the heavens and the earth, and the earth became waste and empty and darkness was on the face of the deep. In the beginning God would have created the heavens and the earth good and beautiful. Then something happened to cause the earth to became a chaos and vacant mess. Something happened between verse 1 and verse 2 which caused the earth to become waste and empty. Further evidence that points to a gap between the fist two verses of Genesis comes from the book of Job. Job 38:4 to7 – when God laid the measure of the foundation of the earth, the sons of God (the angels) shouted for joy. We can see that the sons of God ( the angels) were created before man was created – but why would they shout for joy? Why ever would they rejoice over a vast “ deep” covered with darkness? It is more probable that they were rejoicing over a beautiful creation that would have been wonderfully created with order and symmetry and that was very good – spoken into existence by a God who makes everything beautiful! The event that caused chaos and emptiness would have been the pollution of the universe caused by Satan. He had previously been created as God’s second -in-command; Satan’s origin was wonderful. He was God’s anointed cherub, the one closest to God, holding the highest position in God’s creation. Ezekiel 28 describes his position in the universe before his rebellion and corruption. Ezekiel 28: 13 – You have been in Eden the garden of God. If we read the context, we can see that this was not the Eden in which Adam was put. This Eden was not on the earth, but in the heavens, on the holy mountain of God. The thing that caused Satan’s rebellion and downfall was the pride of his heart. Satan lost his lofty exalted position next to The Most high when he rebelled against God and in the pride in his heart desired to be equal with God. Ezekiel 28:17 says that his heart was lifted up because of his beauty. God cannot tolerate any rebellion among His creatures so immediately after Satan’s rebellion, God declared His judgement on him. Satan was cast out of heaven. God declared…. I cast you as a profane thing Out of the mountain of God; And I destroyed you, O covering cherub, From the midst of the fiery stones. 17 “Your heart was lifted up because of your beauty; You corrupted your wisdom for the sake of your splendour; I cast you to the ground, I laid you before kings, That they might gaze at you. 18 “You defiled your sanctuaries By the multitude of your iniquities, By the iniquity of your trading; Therefore I brought fire from your midst; It devoured you, And I turned you to ashes upon the earth In the sight of all who saw you. The heavens and the earth were defiled by Satan’s rebellion and along with Satan were also judged by God. Job 9:5-7 says that God overturned the mountains in His anger, shook the earth out of its place, commanded the sun not to rise, and sealed the stars. Since we cannot find a record of an event like this in all of human history we must reckon that this judgement must have happened before the time of Adam and Eve. Because of God’s judgement, the heavens did not shine. The earth was covered by darkness. The fact that the earth, after being judged by God, was buried under the deep water proves that God must have judged the earth by flooding it with water. So, “the earth became waste and empty,” buried under deep water, and covered with darkness (Gen. 1:2). That which separates and divides – Especially to the apostle John imprisoned on the isle of Patmos, the sea was something that was separating him from his beloved brothers and sisters in Christ. He was in solitary! John was a lover of men who no doubt loved human company – especially the fellowship of fellow believers. Just across the sea from him was the city of Ephesus which was a great city full of people – the sort of place he would have loved to evangelize and no doubt there were already some Christians that he knew and loved who lived there. The “sea” was separating him from his beloved in Christ. One day for John, and one day for us there will be no more parting and separation. Just as the sea separates nations and people from each other, in the same way there are things – imperfections and subtle forces and attitudes that in this age exist in our lives, that stop even the closest friends being truly one with each other. In the new heaven and new earth – in the eternal state all the negative forces and emotions that tend to separate us from one other will be removed. All of us, In Christ will for evermore enjoy a closeness that we could never ever know now. In the New Jerusalem we will not only recognize each other and share memories of our lives together. We will love each other in a deeper way than we can ever imagine at this time. The “ sea of separation” will be for evermore abolished! No more separation. No more parting; we will recognise each other on that day! The disciples of the Lord Jesus recognised him after his resurrection, as he walked around in His glorified body (John 21:7). In Matthew 17 and Luke chapter 9 Moses and Elijah appeared in glory on the “mountain of transfiguration” with Jesus. They were talking to Our Lord about the mighty DEATH he would accomplish to save us – and in some miraculous way we are told that the disciples recognised both Moses and Elijah. They KNEW who they where. The Lord didn’t come to them and say, Hey – here are Moses and Elijah talking with me. In the same way we will recognise, know and love each other. Yes, we will be like him – and Jesus Jesus knew and remembered His disciples and remembered His life on earth. After his resurrection, as he appeared before them in his spiritual body, he reminded them about the reality of his rising again according to the prophets which he had previously told them about during the time of his earthly life. This is what I told you while I was still with you: Everything must be fulfilled that is written about me in the Law of Moses, the Prophets and the Psalms.”, (Luke 21:44). 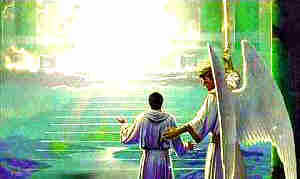 In the New Jerusalem there will be 1000000’s of brothers and sisters in Christ we do not yet know. Not yet! We will one day! At the moment we are separated from them. We may have been born in a different age. They may live or have lived 1000’s of miles away. They may even live in our neighbourhood, but circumstances have not yet brought us together. A SEA DIVIDES US NOW!. One day that “sea of separation” will be no more. We will have the excitement of developing new relationships throughout eternal ages! We will be able to meet new people and develop new friendships. Won’t it be something to be able to spend time with Abraham or Moses or Elijah or Peter? No more sea of separation in that day! We will be as close to each other in eternity as we are now to our husbands and wives in this life. The one-flesh relationship we currently enjoy in marriage is a signpost pointing to our relationship with Christ, who is our bridegroom. Once we reach our final destination, the signpost will no longer be necessary. The purpose of marriage is not to replace heaven, but to prepare us for it (Ephesians 5:31-32). Does this mean that we will not be as close to our husbands or wives as we have been in this world? Not at all! We will be closer knowing that God chose us for each other so that we might sample what life will be like with Him in Heaven.